Nate and I are just flat out lucky sometimes. When we arrived here to Star, we were SO grateful to be welcomed with such warmth like you can only find within the church. A big part of that came from Kyle and Brittany. Wake Surfing is only one such example of their benevolence. Who even skis anymore? We barely even saw any water-skiing or wake boarding out on Lake Lowell, which is in Caldwell, about 20 mins away from where we live. Here’s a little step by step intro to the ‘new thing’! The surf board is much like a wake board but you don’t get strapped in. You start with your heels resting on top. Once inside the curl of the wake, you find your balance and let the wake carry you, rather than letting the boat PULL you… that’s why here, the rope is slack. Kyle and Brittany don’t even use the rope. Nate’s closeness to the boat in this picture is NOT an illusion. You’ll see in the videos that you can hold conversations and hear the music really well since you are so close to the party. While Nate was doing his thang, we had fun with his camera! I wish I could pull off white shades! What mother of two can actually do this??!?! She’s such a babe!! She has an amazing save here! This is Nate’s FIRST RUN! He’s such a natural! He’s still a cowboy at heart though… you’ll see why! I had a GREAT cheering section though! 1.) The boat we were riding is an ’08 Malibu Wakesetter… PIMP! 2.) We used whats called a Fat Sack [or Ballast] to add weight to the back to get a bigger wake. We pumped about 500 lbs. worth of water into it. 3.) There was a guesstimate of 2000 lbs. in the back of the boat with every one’s weight included. 4.) 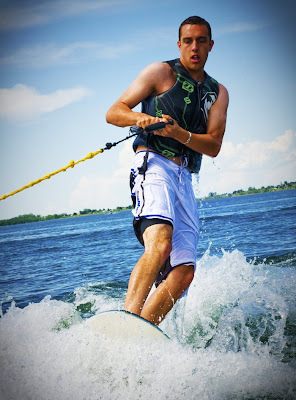 The average speed while wake surfing is about 10-12 mph. That’s so nice, so when you biff it, it’s not like hitting pavement. 5.) The water that day was about 75 degrees. 6.) I LOVE MY LIFE!!! ***I’m still trying my hand at photo editing. I give big kudos to Nate! Blogger isn’t very accurate with imitating the edits that we spend so much time on. It tends to flatten the image. I had to crank up the contrast, vibrance and add a few filters to get the look that I wanted AFTER posting it to the Blog. Hope I didn’t over-correct! Bree - How FUN!! That is so awesome you guys got to go do this!! And I'm glad you still hang out with your office friends when you have WAY cooler friends with hookups!! haha! JK! The pictures look amazing, glad you had a blast!! Mandy - WOW! Wake surfing looks like SOOO much fun! I can't even wake board, so maybe I could do this! I've got to tell Trav! Awesome job you guys! You're pros!! !